If you think about it, dehydrating food is not really rocket science. All a food dehydrator really needs to do is maintain a constant temperature and air flow. Most machines have a temperature thermostat to maintain the desired temperature and a fan to circulate fresh dry air. We strongly recommend staying away from any product that does not come with a fan and thermostat. We at Meat Processing Products only sell high quality machines with fans and thermostats. If you are wondering how to choose a food dehydrator, you have come to the right place! Each of these two dehydrator types has its own unique advantages and disadvantages. We will refer to these two designs as we review each of the factors below. The most important thing to consider when buying the best food dehydrator is even heat and air distribution. There is nothing more frustrating than having part of your batch get much drier than another part. Uneven heating and air flow can cause the food that is closer to the heat and air source get drier much faster than the food that is further away. The heat and air flow of shelf food dehydrators are generally very even because of the nature of the design. The trays in a shelf dehydrator slide out and look and work just like the trays in your conventional oven. This type of food dehydrator generally has the heating element and fan mounted in the back of the unit and the warm air flows horizontally across all the trays evenly. Uneven heat and air flow is a problem that is found almost exclusively in certain stackable food dehydrators, especially the less expensive department store models. Stackable food dehydrators typically have their heat source mounted in the bottom of the unit, so the trays on the bottom get the lion�s share of the heat and air flow. Many economy models do not even include a fan. Because of the vertical heat and air flow, owners of the economy stackable dehydrators must rotate their trays periodically to avoid over-drying some trays and under-drying others. We suggest that you avoid the economy stackable dehydrators. We do not offer this type of dehydrator here at Meat Processing Products. The newer and higher quality stackable food dehydrator models are engineered to provide much more even heat and air flow than the cheap models. For those who prefer the stackable tray dehydrators, we recommend the L�Equip Dehydrators and the American Harvest / Nesco Dehydrators. The L�Equip and Amercian Harvest dehydrators are designed in such a way that the fan and heat source are almost completely sealed off from the trays to prevent the bottom trays from excess heat exposure. The warm dry air in these dehydrators travels up through tunnel-like ducts in the center of each tray and is distributed to each tray like a home�s central air system delivers conditioned air to each room in a house. No tray rotation is needed for the L'Equip and American Harvest / Nesco food dehydrators. Another factor to consider when purchasing a dehydrator is the ease of access to the trays. You need to get at the dehydrator trays when preparing and setting up the food for dehydrating, when you check on the food�s progress during the drying process, and when you are ready to remove your dehydrated food from the trays for storage. Setting up, checking on, and removing food in a shelf dehydrator couldn�t be easier. Each tray pulls out individually, just like the trays in your conventional oven. With a shelf dehydrator, there is no need to fuss with the trays above or below the tray you are working on. The story is completely different for stackable dehydrators. If you want to access a tray in the middle of the stack, you need to lift off all of the trays above it. Lifting off higher trays can not only be burdensome, but can also cause frustrating accidents and spills if the trays topple. Some stackable dehydrators have 6, 10, 12 or even up to 20 trays. It's important to consider how it may be a bit cumbersome to work with so many trays stacked on top of each other. When you invest in a piece of equipment like a dehydrator, you want it to be as versatile as possible. When considering between the shelf tray dehydrators and the stackable tray dehydrators, each one has a different advantage over the other when it comes to versatility. First of all, the shelf tray dehydrator has a great advantage of allowing clearance between trays for times when you wish to dehydrate �tall� things. Just like a conventional oven, you can simply remove trays to have as much vertical clearance between trays as you need. For example, the stackable dehydrator allows you to make dried flowers and beautiful crafts (e.g. dough art, dried apple art, some clay crafts, etc.) that could not otherwise fit in the small space between stackable trays. You can also make yogurt in your own jars in a shelf dehydrator that would not be possible in a stackable dehydrator. Though the stackable dehydrators don�t have much clearance between trays, they do have an advantage that the shelf dehydrators don�t have: expandability. Stackable dehydrator models usually come with 4, 6, 8, or 10 trays right out of the box. 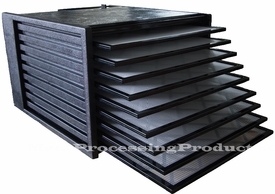 However, you can purchase additional trays to increase the capacity of your dehydrator as your dehydrating needs grow. Stackable dehydrators come with enough heating and air flow capacity to expand to at least twice the number of trays that they originally come with. On the other hand, because of the constraints of their box design, shelf dehydrators can not be expanded. If you outgrow your shelf dehydrator, you have to purchase whole new unit to increase your drying capacity instead of just purchasing some additional trays. Finally, when making a dehydrator purchase, you want it to last. All of the dehydrators we offer at Meat Processing Products are high quality models that have multiple year warranties. Most are made of durable food-grade FDA approved plastic materials. However, many people are concerned about the possibility of plastic fumes or chemicals leaching into foods at warm temperatures. Though we are not able to confirm whether this is true, and the FDA indicates that these materials are safe, it is food for thought. For this reason, as well as for the great look and obvious durability, many people choose to purchase an all-stainless steel model dehydrator. We offer 5, 10, and 14 tray Stainless Steel Dehydrators for home and commercial use.